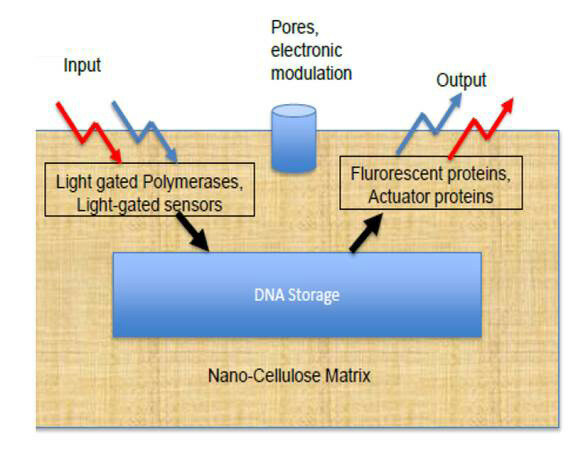 the potential of ultrahigh density data storage (Billions of Gigabyte) embedding DNA ultrafast (million times faster than conventional computer chip) information processing of the nanocellulose embedded DNA use of light and light-gated proteins instead of electronics safe data storage for many thousands of years. The emerging technology uses nanocellulose as a matrix for a tissue repair plaster. Light-gated proteins are embedded and can displaythewoundcondition. Light-induced releaseofgrowth-factorsor phar- maceuticalscan support and accelerate wound healing. The novel chip technology can be used as a novel data storage system, as a computer chip or a weara- ble for wound healing. Proof of concept (nanocellulose laboratory demonstrator with light gated constructs).